Not a bad year in the shot for Kent State’s Danniel Thomas-Dodd! Fourth at the World Championships. And now, the subject of a technique analysis on McThrows. I’ve never met her coach at Kent State, Nathan Fanger, but I know he’s a patient man because he graciously answered approximately 472 questions from me while breaking down Danniel’s technique. I think you’ll like the resulting interview. 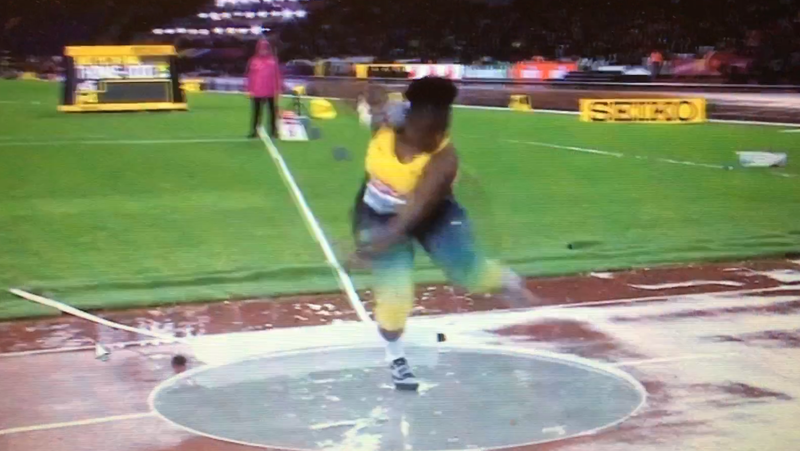 McQ: Let’s take a look at Danniel’s 18.91m throw from London. I figure analyzing that will give you a nice endorphin buzz. Here’s her windup. The thing I notice about it is that it is very simple. 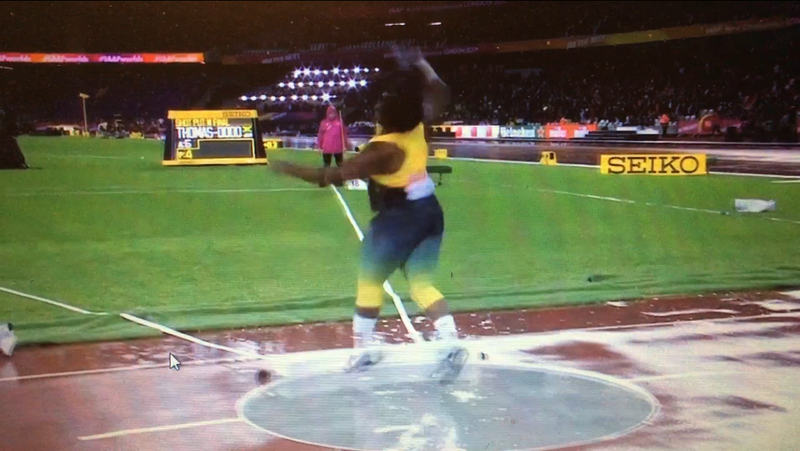 Some throwers sit lower, wind farther, or lean forward a bit. Danniel seems to be doing a nice, easy, minimal wind. Can you comment on that? What is important to you about this phase of the throw? Coach Fanger: This position, even though is very simple, is the key to her success! We have played with getting low or having a wider sweep, but her balance was always slightly shifted. She is an extremely fast athlete and has classically blown past this position, so we have done a lot of static starts to activate her legs instead of using too much upper body. That said, the use of her left arm is incredibly important. Allowing the left arm to sweep out ahead gets her body moving very quickly. Her ability to get her legs moving just as fast is what allows her to throw as far as she does. She is a speed thrower and it all starts out of the back! McQ: This is a couple of frames later. She is turning her left foot. Her left arm has swung open. Could you talk more about what you are looking for here? You mentioned an active left arm action. Would you elaborate? Coach Fanger: What we are looking for here is an activated left knee drop and an opening up of the left arm. When she stays tall out of the back she accelerates easier to the middle. We have learned that if she gets lower with her legs like in her discus throw, then she ends up hopping up and floating to the center. This initial dropping of the left leg and left arm sweep helps her get grounded in the center of the ring faster, which in the long run creates more torque and separation. The left arm sweep really starts both direction and speed for her. 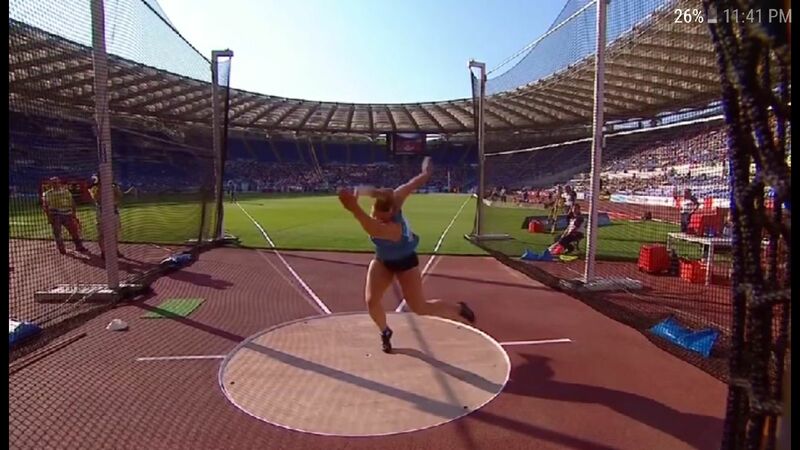 A lot of people would not advocate such an aggressive upper body movement, but this movement–if done in a rhythmic fashion–is the best thing for a smaller-statured thrower. McQ: A common cue when teaching rotational putters is that they should keep their left arm over their left leg as they start turning out of the back. In Danniel’s case, you’re saying it is better for her to be more aggressive with that left arm, so that cue would not work for her, correct? Coach Fanger: For Danniel, I keep the left arm over the left foot in the initial start of the throw. Its starts to get ahead of the system after about 90 degrees of rotation–the arm essentially pulls her into her drive to the center. I think this is under-utilized in smaller throwers. The speed of the throw is crucial. I personally think you need to go as fast as the left leg will allow you to block–meaning, if I keep my left arm and left leg together I create speed and torque yes, but to what degree? Can you gain more? Probably yes, BUT if you go too fast and let the upper body take over, the block leg will be delayed and not be used. Or, even if the left leg was able to get down in time, is it strong enough to fully block the body with that type of speed? 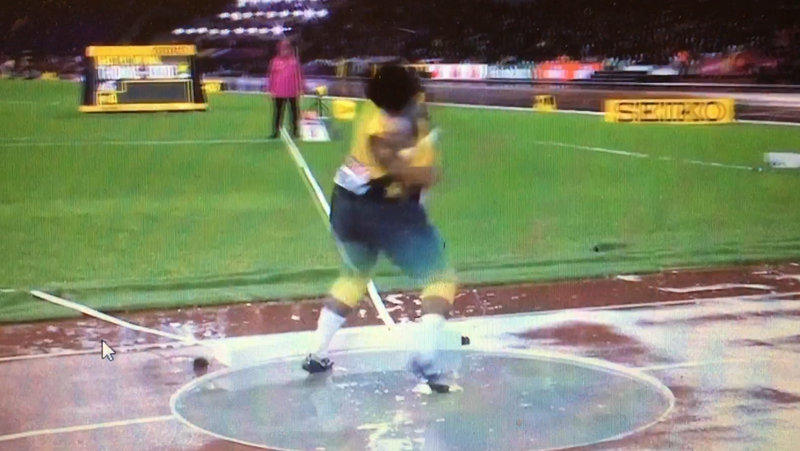 For bigger shot putters, I would never want that arm to over sweep. Trying to stop say 300 lbs of moving force is extremely difficult. McQ: As she turns her left foot and gets set up to drop the left knee, at what point do you want her right foot coming off the ground? Some teach getting it off as quickly as possible. Others prefer keeping the right foot grounded until the left foot is turned down the right foul line, so basically the right foot would be ripped off the ground as the thrower drops the left knee. Could you talk about your ideas on this phase? Coach Fanger: As far as the right foot getting off the ground, I don’t think of it as late or early. We actually don’t talk about that aspect of the throw at all really. I think of it as a reactionary movement of the the left knee dropping and the flexibility one has in their hips. As her left knee drops, it creates a wide “V” position in her hips and the right leg lifting off is a reaction to that drop. I think a lot of coaches try to coach an action verses a reaction. A reaction is a far faster movement then a voluntary, thought-out, action or movement. For some people, that thought helps generate the initial starting movement–for us, not so much. Each athlete is so different in their type of abilities and their motor patterns. I think the best athletes should focus on an initial movement or action that corresponds with a reactionary movement (creating speed). I mentioned the openness of the hip and flexibility as well. If she drops the left knee down and she is tight that day, say from doing squats the day before, then the reacation is slow and short. So, the more flexibility one has in the hips the more stretch, or separation one can create. Like pulling a rubber band back–the more stretch it has, the farther it can fly when let go. ...Danniel is using her left arm to create momentum and set herself up to drop on her left knee. This dropping action will pull her right foot off the ground. Can you comment on this next frame? …She has dropped her left knee, but some might argue that her right leg is lagging behind and that her left foot has over rotated. Could you explain why this position works for Danniel? Coach Fanger: For sure. I really advocate for the use of that left arm to be more active out of the back which leads to the position we see. 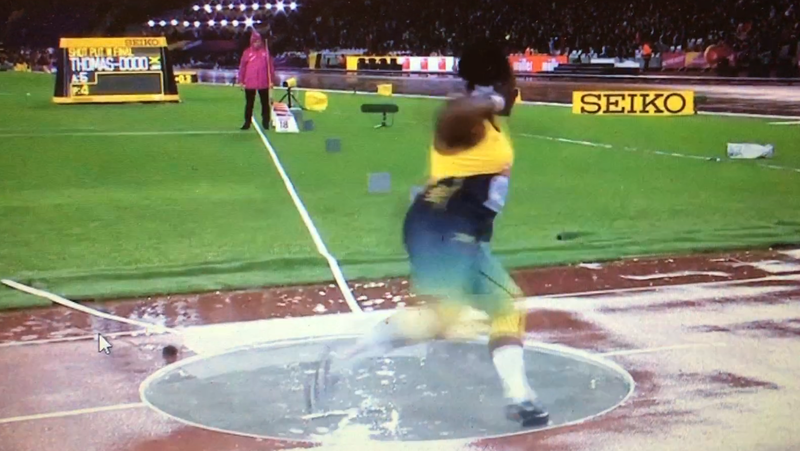 The right leg takes a back seat while the left side gets the body moving at the start of the throw, but the reaction that comes from this left leg drop is quite significant. As that left knee drops it kicks the right leg out and puts the muscles in a strongly stretched position. She is able to react much more aggressively from this stretched phase vs. trying to actively set the right leg out in front. Even though this position looks like she is leading the throw with her upper body, it is creating speed that she can use later in the throw as strong separation. The over rotation of her left foot is the result of such a dramatic movement out of the back. The key is not to let it to continue to rotate from the position you see. Right now, it is pointed towards the direction of the throw (our linear drive). 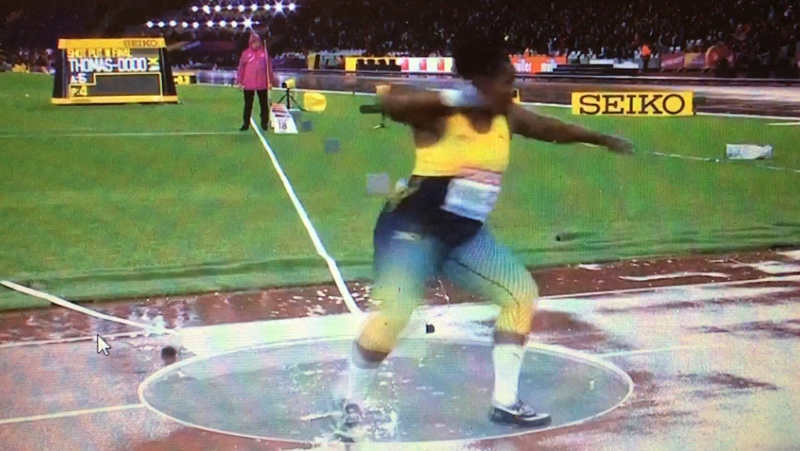 The left side is what is so crucial in her throw. That left knee drops hard to the direction of her throw, which allows the right side to actively wrap hard and around to the center. With a smaller thrower, I try to advocate more linear work than rotational work. The bigger athletes can and will use more rotational movement because of their size and the size of the ring. 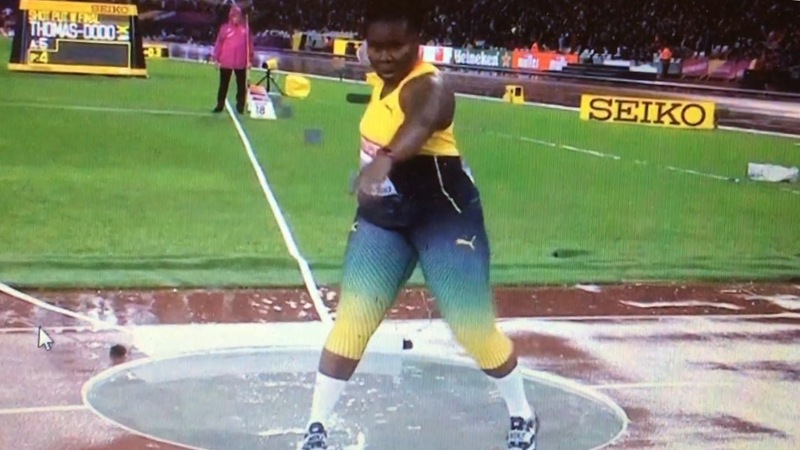 To those of us who believe in…what would you call it…the “Venegas” approach?…it sure looks like her left leg is late out of the back as her right foot lands in the middle, and that her upper body is going to pull her into the throw. But then she hits a really nice power position. Can you explain to us Venegas disciples how she does this? She appears to be working the left arm hard to stay wrapped. Is that the key? Coach Fanger: This was difficult for me to accept as well. These are non-standard positions. But, females throw different than males. 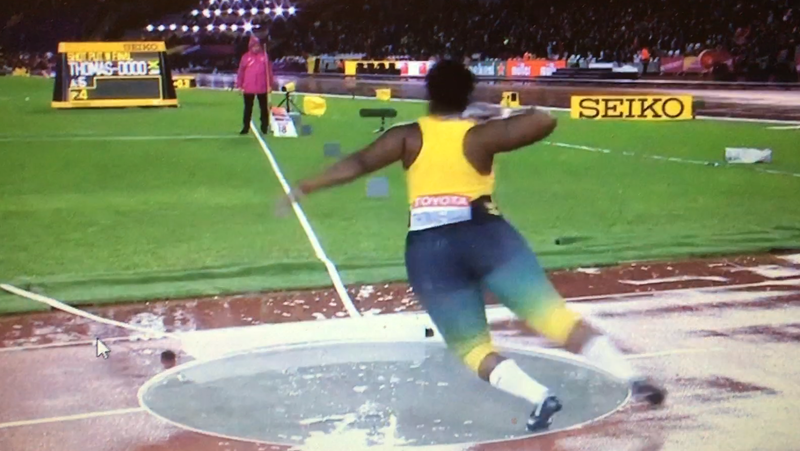 We can see the obvious difference in the discus, but there have not been a lot of consistent female rotational shot putters to analyze and pick apart. I’ve had to allow myself to adapt to her femininity in her throw. 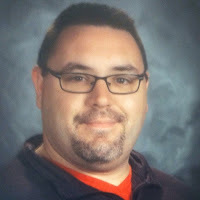 I, like you, know and understand the Venegas approach very well, but if you think about it 6’2″ to 6’7″ men that weigh 265 to 350 pounds are far different than Danniel, who is 5’4″ and 210. That left arm is what is so important again, since we use it to swing open and create so much early momentum, then it is also used to to put on the breaks in the middle of the ring. AND that is where Danniel’s throw truly is, in the middle. …really shows her attempting to pre-turn the right foot as it is about to make ground contact, something we are working on more as well. In this particular throw she was a little more hoppy than I would have liked to see. The rain played with what she could do out of the back. I would have liked to have seen more directional drive, but she let the body lift and float to the center instead of grounding sooner. But you can really start to see that left arm swing back so as to delay her upper body while the legs continue to load in the center. McQ: Here are some photos of the final phase of Danniel’s throw. When I look at them, I see her doing a great job of getting her right heel up while her right leg is still loaded and the right elbow is behind the right foot. Also, when she finishes her reverse, she is right smack in the middle of the toe board, which is usually a sign that things have gone well up to that point–that she got out of the back on balance, hit a balanced power position, then used her legs (rather than her head and left shoulder) to blast into the throw. Coach Fanger: The first two pics are of her being loaded and back on that right side, her loaded spring. The left arm that was allowed to swing open out of the back has to wrap back and hold her shoulders back while her hips stay open and turning to the throw. She has a very strong lower body and she uses it very well to turn and drive through the finish. We really focus on keeping the shoulder up and back to create as much wrap as possible. The third pic is a crucial part of her throw! You can see what I call the “car crash” of the throw. It is her hips colliding at full force. That left leg holds a strong block while the right side drives aggressively out. 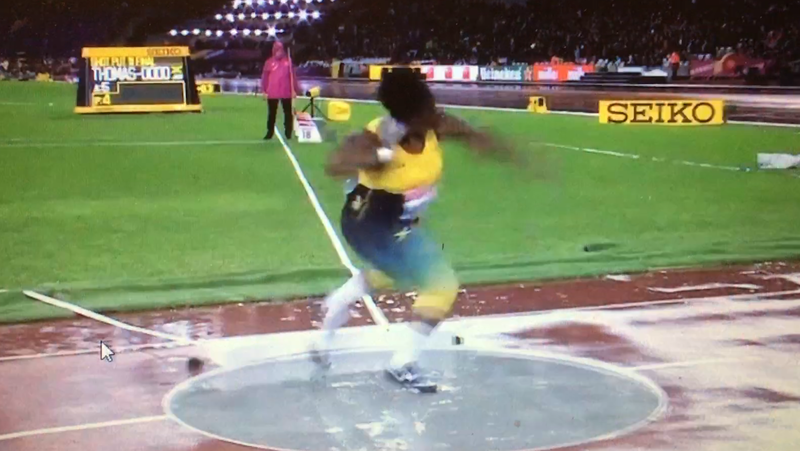 The collision of the hips accelerates the shot put up and out of the hand! The last picture before the reverse is the extension through the throw. We are really working on staying longer on the left leg block at the release. 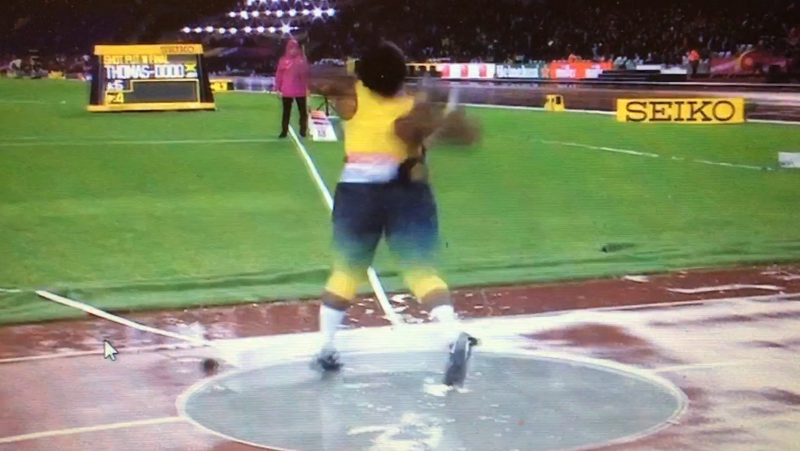 (In this particular throw she got off the left side far to early–the rain was not optimal to throw in, but it was what it was.) 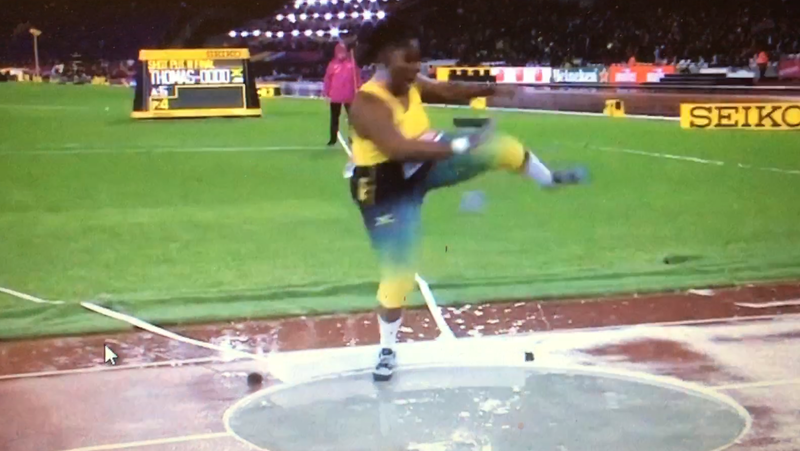 It is key that the left arm blocks so she can square her shoulders to the throw. If her shoulders are square and her left side holds, she gets optimal extension through the ball. Danniel doesn’t have long levers so she needs to use every bit of extension she can. The last picture we see is of her reverse. She is very well-timed here and puts the left leg down in the middle of the toe board. She is very consistent with her reverse, so there is not much we work on here. BUT the more extension we get by staying long at the release will definitely start testing her ability of an easy save. We will definitely continue to work her finish! The main cues we use at the finish are, shut down that left side… EXTENSION through the ball…Reach the armpit over the toe board…Commit to the finish!